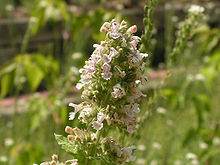 Nepeta cataria, catnip or catmint, is a species of the genus Nepeta. It is in the Lamiaceae family. The name "catmint" is sometimes used for the genus as a whole. The nepetalactone in catnip acts as a feline attractant after it enters the cat's nose. At the olfactory epithelium, the nepetalactone binds to one or more olfactory receptors. The catnip effect works on the whole cat family, not just on domestic cats.. Several tests showed that leopards, cougars, servals, and lynxes often reacted strongly to catnip in a manner similar to domestic cats. Lions and tigers may react strongly as well, but they don't react all the time. With domestic cats, N. cataria is a recreational substance for pets to enjoy. Catnip and catnip-laced products are available to consumers. Not all cats are affected by catnip; roughly one third are not affected by the plant. The behavior is hereditary. Some other plants also have a similar effect on cats, include valerian (Valeriana officinalis). ↑ 1.0 1.1 "Nepeta cataria information from NPGS/GRIN". ARS-GRIN.gov. Retrieved 2008-04-07. ↑ Flora of China Vol. 17 Page 107 荆芥属 jing jie shu Nepeta Linnaeus, Sp. Pl. 2: 570. 1753. ↑ Spadafori, Gina (2006). "Here, Boy!". Universal Press Syndicate. Retrieved May 3, 2014. ↑ means: when a stimulus continues, the sense organs fire nerve impulses ever less frequently. ↑ Arden Moore (20 July 2007). The cat behavior answer book. Storey. ISBN 978-1-60342-179-9. Retrieved 18 July 2013. ↑ Siegel, Ronald K. Intoxication: the universal drive for mind-altering substances. Inner Traditions / Bear & Company. p. 63. ISBN 978-1-59477-069-2. ↑ Hart, Benjamin L.; Leedy, Mitzi G. (July 1985). "Analysis of the catnip reaction: mediation by olfactory system, not vomeronasal organ". Behavioral and neural biology 44 (1): 38–46. doi:10.1016/S0163-1047(85)91151-3. PMID 3834921. ↑ Durand, Marcella (March 4, 2003). "Heavenly Catnip". CatsPlay.com. Archived from the original on May 15, 2013. Retrieved January 2, 2015. This page was last changed on 16 October 2018, at 12:24.